The Aids Health Care Foundation (AHF) is allocating over US$1 million to support the prevention and treatment of HIV/AIDS/STI in three target regions of Laos. While all Mekong nations are impacted by illicit trafficking, Laos is the only state sharing a land border with all the countries in the sub-region, which makes it more vulnerable to transnational crime. The 1st Cambodia-Laos-Vietnam Buddhist Leaders’ Conference was hosted in Vientiane on Monday to promote traditional relationship, solidarity and cooperation on Buddhism among the three countries. An international manhunt stretching from Wisconsin to Southeast Asia has ended following the arrest of a suspect wanted for sexually assaulting a woman in a Green Bay alley. Joint cooperation between Laos and Russia to combat the unexploded ordnance (UXO) threat in central Laos’ Borikhamxay province has seen progress after the project began a month ago, local daily Vientiane Times reported on Tuesday. Twenty-six technical and vocational education and training teachers from the tourism and hospitality sector have completed an intensive training programme. Poor quality, excessive cost and the slow progress of road construction projects dominated discussions at the cabinet’s monthly meeting for November, which sought solutions to these chronic problems. The Australian Embassy has become a founding sponsor of Lao PDR’s international art exhibition and prize – ELEVATIONS LAOS | Exhibition + Art Prize. The community housing project “ARATA Garden Residences”, on the back side of LAO ITECC and next to That Luang Lake of Xaysettha district, will start its construction in early 2019 and is expected to be completed by the end of the first quarter of 2021. Mrs Jin Hyo-Sun, spouse of the Republic of Korea Ambassador to Laos has introduced “Kimchi and Bibimbap” – two signature dishes of the Republic of Korea – to spouse’s leaders and ambassadors in Vientiane Capital. 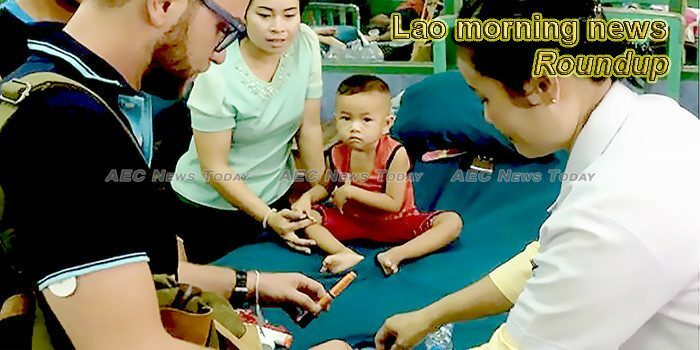 This week’s Lao morning news feature photo acknowledges World Diabetes Day, November 14.